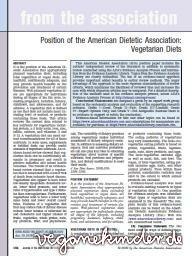 This American Dietetic Association (ADA) position paper includes the authors’ independent review of the literature in addition to systematic review conducted using the ADA’s Evidence Analysis Process and information from the Evidence Analysis Library. [...] The use of an evidence-based approach provides important added benefits to earlier review methods. The major advantage of the approach is the more rigorous standardization of review criteria, which minimizes the likelihood of reviewer bias and increases the ease with which disparate articles may be compared.